Is latex foam truly a healthy and sustainable option for upholstered furniture? The raw material for latex foam is obtained by tapping rubber trees in much the same way as maple trees are tapped for sap to make maple syrup. The trees are carefully tended to ensure years of productivity. 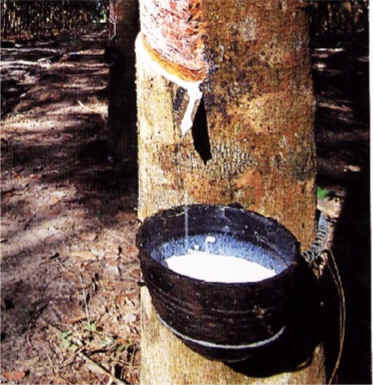 Historically, latex milk was harvested by small holdings in southeast Asia. Today larger plantations have been established to meet the growing demand. The raw material is processed into 100% natural or blended natural/synthetic latex. 100% synthetic latex is produced without the milk from the tree. The blends and synthetics are often blanket-labeled by suppliers as “natural”, creating confusion about what you’re actually getting. My reference to natural refers to the 100% latex-from-the-tree, with zero synthetic rubber content. If the supplier can’t tell us the percentage of natural and synthetic content in their products, we don’t buy from them. Two processes, called Dunlop and Talalay are commonly used in manufacturing both natural & synthetic latex foam. It is important to note that the Talalay process produces a more durable foam, and uses minimal chemicals in the aerating and gelling steps – compared to the Dunlop process. 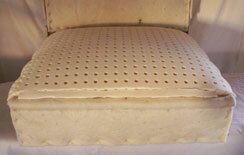 The manufacturer of the 100% natural Talalay latex used in our furniture does not use any solvents in their processing. Their Talalay latex is certified by Oeko-Tex (Europe’s highest environmental consumer product standard) to be free of harmful substances or chemicals. 100% natural Latex foam is naturally hypoallergenic, dust mite resistant and antimicrobial (inhibiting the growth of bacteria, mold and mildew) without chemical additives or synthetics. Due to thorough washing in the final stages of production, manufacturers claim that 100% natural latex also reduces the tendency for aggravation of latex allergies by significantly removing the plant proteins. Blended latex manufacturers may also make this claim on the basis of the natural latex component in their finished products. However, people with acute or life-threatening allergies should always practice caution and seek the advice of their doctor or health professional.